Cartoon by Duncan Macpherson, Toronto Star, December 5, 1972. Clockwise from left: Dan Heap, Joe Piccininni, David Crombie, possibly Fred Beavis, John Sewell, William Kilbourn. Victory took a while to sink in for David Crombie. As returns flowed into his campaign headquarters at 887 Yonge Street on December 4, 1972, he sat in a back room for several hours watching television coverage. His company was a box rapidly filled with slips showing the night’s results. Though the polls were favourable, he didn’t want to jump to any premature conclusions. For much of the campaign he endured naysayers among supposed friends, earned only one newspaper endorsement, and fought two strong opponents who were previously allies. Six weeks earlier, he had nearly thrown in the towel. An hour after polls closed, half an hour after the booze starting flowing, and with each slip showing an increased lead, Crombie still wasn’t convinced he had won. He urged campaign manager Bill Marshall to avoid issuing any statements until victory was confirmed, even if that meant missing the Globe and Mail’s deadline. Meanwhile, Crombie HQ filled with prominent supporters: artist Harold Town, architect Jack Diamond, and MPP Morton Shulman, who had decided not to run for mayor when Crombie made his intentions known. When the night ended, City Hall was turned upside down. The three main mayoral contenders. Globe and Mail, September 15, 1972. Forces of change had simmered since the 1969 municipal election produced a divided council. On one side was the “old guard” of Mayor William Dennison and veteran aldermen who favoured large-scale development projects regardless of their impact on communities or heritage properties. This group ignored citizen complaints as the work of malcontents; when 100 homes north of High Park were razed for high-rise apartments, alderman Fred Beavis observed, “All we’re doing is recycling some old houses.” Secret discussions with developers and other levels of government were not unknown. Had the old guard gotten its way, remnants of downtown landmarks like the Church of the Holy Trinity or Union Station might have found a resting place at the Guild. On the other side was a group of reformers represented by freshmen councillors like Karl Jaffary, William Kilbourn, and John Sewell. They annoyed the old guard through their tactics and vitriol, drawing on the growing political consciousness of community activists and ratepayer associations in calling for greater accountability for development. The reformers sensed a growing unease among residents about Toronto’s rapid growth, potentially ripping apart the neighbourhoods at its heart. Over the course of the 1969-72 council term, the reformers achieved significant victories, notably the blockage of high-rise apartment towers in Trefann Court and the cancellation of the Spadina Expressway. 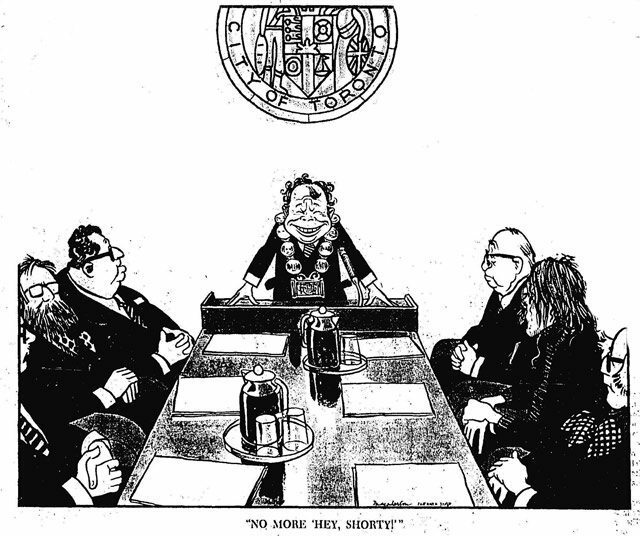 As the 1972 election approached, the question was: How would the reform movement coalesce to take full charge at City Hall? It wasn’t a homogenous group, more an informal network straddling income brackets and party lines whose primary concern was preserving Toronto’s human scale and ejecting the old guard. The reformers used various communication tools: newsletters (City Hall, written by council’s reform wing), community papers (7 News, reflecting the fights in Ward 7, where Trefann Court was located), and umbrella community groups like the Confederation of Resident and Ratepayer Associations (CORRA). By the end of 1971, activists under the banner of Community Organizing 1972 (CO’72) began strategizing. Party slates failed during the 1969 campaign, so no official banner was adopted. Support was given to particular candidates in each ward so that they didn’t cancel each other out in the attempt to boot out the old guard. Among the prominent recruits were Spadina Expressway opponent Colin Vaughan and social activist cleric Dan Heap. There were divisions over handling the mayoralty. While some felt there should be a candidate, others believed that since the mayor was only one vote on council, money and resources were better spent on ward races. Besides, the best-known reformers carried ideological and personality weaknesses that harmed their overall acceptability. Candidate button designs, Toronto Sun, December 4, 1972. While Crombie mulled his options, the press had anointed two frontrunners to succeed Dennison. One was senior Ward 11 alderman and one-time CIVAC ally David Rotenberg. First elected in 1960, Rotenberg was effectively mayor as Dennison increasingly served as a figurehead. He was the city’s budget chief, guided the decisions of the executive committee, and set the tone for how the majority of council voted. Rotenberg worked hard, building an extensive knowledge of the mechanics of City Hall that played a part in the endorsements he received from the Star and the Sun. Beyond his past support of the old guard, Rotenberg’s major weakness was his public persona as a cold technocrat. “His voice grates and he moves with rapid and jerky motions that offend your sense of grace,” Toronto Life observed in late 1971. “He listens as impatiently as he talks, always charging ahead confidently on the crest of his own thoughts, anxious to get going because he has all the facts, knows all the angles, understands all the dimensions.” Among his main planks was a “land stabilization bank” which would purchase obsolete industrial land for future redevelopment as residential neighbourhoods. Following a European vacation in early July 1972, Crombie was the first of the trio to officially declare his candidacy. “People are fed up with the polarization of council and the constant screaming and yelling,” he told the Star. He hoped an early start would make him the “people power” candidate. Prominent reformers like Jaffary and Kilbourn continued to worry that Crombie would draw attention and funding away from the ward races, and urged him to drop out so that he would be guaranteed to win the senior alderman spot in Ward 11, which would allow him to support reform efforts at city and Metro Toronto councils. 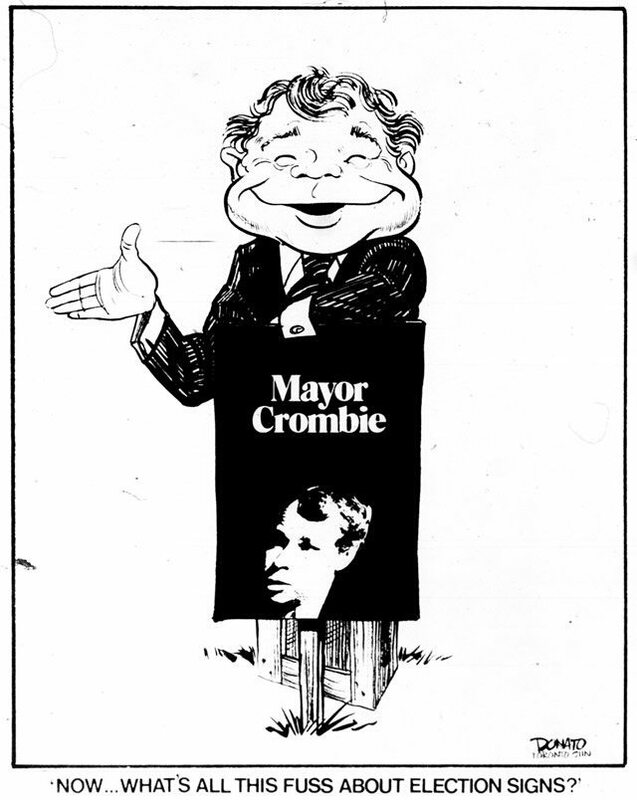 Beyond the concerns of reformers, Crombie’s campaign stumbled early on. An inexperienced team didn’t help, nor did his small, teddybear-like appearance. The press regarded him as a wide-eyed idealist. He lacked the financial backing of his contenders. When fall arrived, he considered packing it in. It didn’t hurt that his opponents’ campaigns self-destructed. Rotenberg’s chilly persona hurt his chances, as did his sarcastic dismissal of opponents and citizen groups as “negativists” who wanted “to stop all progress and let the city die.” His handling of a garbage strike, along with the revelation that he held a mortgage on a property with notorious landlord Phil Wynn, didn’t help. O’Donohue later admitted that while he enjoyed the campaign in the beginning, “I could not get used to all the phony gimmicks needed to attract voters and media attention.” One of his last bad moves was to send a letter to separate school supporters urging them to elect him as the city’s first Catholic mayor, which prompted opponents to pounce on him for bringing religion into the race. 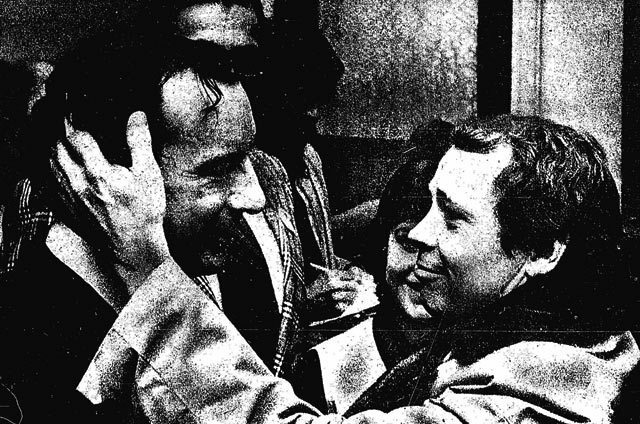 “Still friends after campaign, loser David Rotenberg and winner David Crombie are near tears at Rotenberg’s headquarters.” Photo by Doug Griffin, Toronto Star, December 5, 1972. Not that Crombie was immune to mishaps. One day, O’Donohue’s 10-year-old son Daniel wandered into Crombie HQ, where he and a friend were treated to orange juice and cookies. Shirley Crombie asked if they wanted to do anything, which led to the boys spending half an hour sorting material for scrutineers. When a photographer showed up, a campaign worker pinned Crombie buttons on Daniel. Embarassed, he went to the bathroom to remove them, then fled the premises. When he tearfully returned to his father’s HQ farther north on Yonge Street, he feared his father’s reaction. O’Donohue’s staff went ballistic. By the campaign’s end, Crombie looked comfortable, as his natural rapport with the public and good humour shone through. O’Donohue continued smiling, but looked pained whenever anyone suggested his campaign literature was corny and quickly steered any conversation back to politics. Rotenberg appeared haunted, his shyness becoming more apparent in intimate situations. A winter storm hit southern Ontario on election day, producing record-low temperatures in Toronto and eight other locales. Despite the misery, around 43 per cent of eligible voters cast ballots. The reformers’ focus on ward races was rewarded with a majority on the new council. Only four old guard members weren’t turfed. Incumbent reformers performed very well—in Ward 7, Jaffary and Sewell (who joked that he “may even get a haircut”) increased their tallies by more than 5,000 votes each. Both went down to City Hall to celebrate, urging guards to let people into the rotunda to mark reform’s victory. 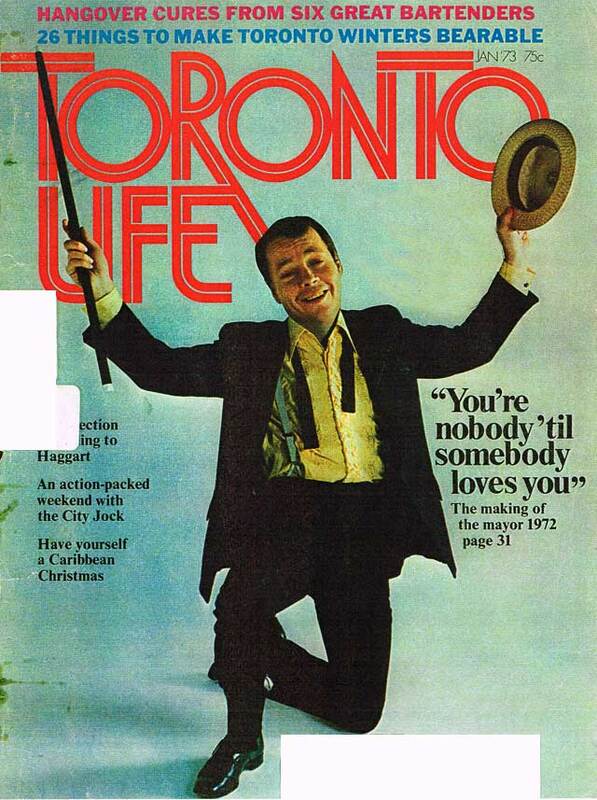 Cover, Toronto Life, January 1973. As election night receded, questions arose on how Crombie would corral the new council, and how it would reshape the city. His six years as “the tiny perfect mayor” saw the implementation of height restrictions and the development of mixed-income areas like the St. Lawrence neighbourhood. Crombie’s reputation as a conciliator carried through his subsequent career as a federal MP and respected urban affairs advisor. 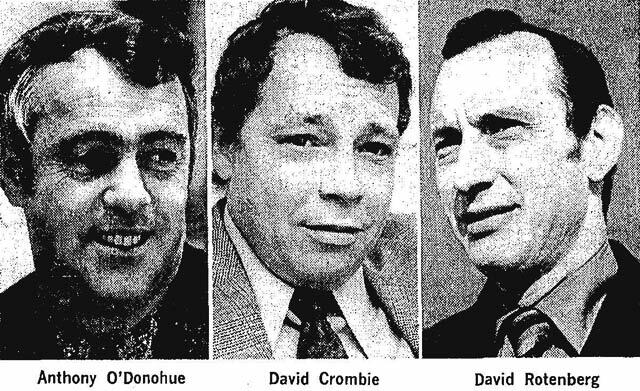 As for his competitors, Rotenberg served as an MPP for nearly a decade, “while O’Donohue returned to council in 1974 and, apart from a brief break following another mayoral run in 1978, served until 1994. In the end it was that David Crombie could see what was wrong with Toronto, and that a majority of voters thought he was right, and that the matter was urgent. He convinced the people of this city that he was a desirable alternative to a City Hall that had become a rubber stamp for developers. It is a statement about Toronto. But it is also a statement about David Crombie. Additional material from The Tiny Perfect Mayor by Jon Caulfield (Toronto: James Lorimer & Company, 1974); Front Row Centre by Tony O’Donohue (Toronto: Abbeyfield Publishers, 2001); the January 17, 1972, September 19, 1972, November 25, 1972, November 28, 1972, December 1, 1972, and December 5, 1972 editions of the Globe and Mail; the November 1971 and January 1973 editions of Toronto Life; the June 28, 1972, July 7, 1972, August 19, 1972, November 18, 1972, November 22, 1972, November 23, 1972, and December 5, 1972 editions of the Toronto Star; and the December 5, 1972 edition of the Toronto Sun.